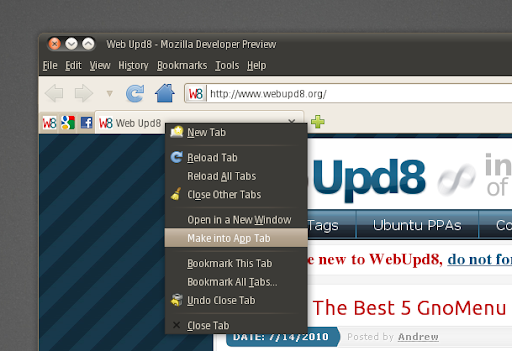 The latest Firefox 4.0 Beta 2 pre brings a long awaited feature: app tabs. This feature is very similar to the "Pin tab" option in Chrome: the app tabs use only favicons for the tabs and all the links you open from an app tab are opened to the right of all the app tabs. To create an app tab, simply right click any tab and select "Make into app tab". Warning: using the above PPA will result in daily Firefox updates! Also, your all your Firefox versions will be updated to the latest nightly build. Once installed, you can run it by going to Applications > Internet > Mozilla Developer Preview Web Browser. For other Linux distributions, Windows and Mac OSX (or if you don't want to install Firefox 4.0 in Ubuntu and just want test it), you can download Firefox 4.0 beta 2 pre from HERE. To run it under Linux, extract the downloaded archive and double click the file called "firefox" (important: not firefox-bin! ).